I don't think I could ever get tired of looking at this particular shade of blue. 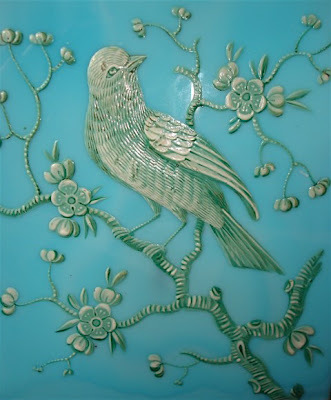 The vintage vases are made from French opaline glass with a handpainted bird-and-branch design on all four sides, and measure nearly 7 inches tall by about 2 inches deep. 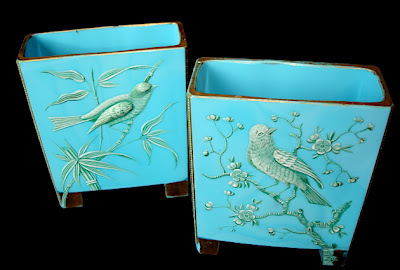 They would look equally stunning filled with spring-flowering branches or simply adding a bold dash of color and a dose of old-school elegance to a room. thanks to you and joni, i have a new ebay obsession. how can you not say 'no' to these little glass confections. Hi - thanks for the mention!!! Hi Megan!!! btw, I've had your blog on my google reader forever, I'll add you to my blog roll tonight.